A Tussy Mussy refers to a petite Victorian style posy arranged within a metal (traditionally silver) or even glass vase holder suited for carrying. In Victorian times, they were originally used to ward off smells from the streets before bathing was common. Sort of a nosegay. Pictured is Flower Avenue's modern slant to a Tussy Mussy in that it does not have the scented florals and is larger than the traditional Victorian posy holder. Nevertheless, it is great for a Victorian theme and also fantastic for incorporating something 'old' in the saying of "Something old, new, borrowed......."! The world of nature has often been turned upside down and inside out with genetically modified crops, new hybrids and whatever technology has thrown at it. 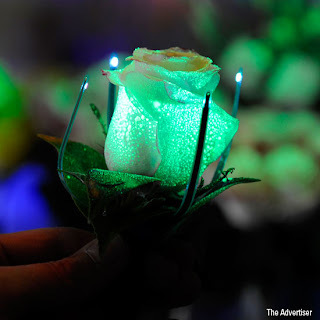 And, fluorescent flowers is at best not a new thing as Bioconst, an Adelaide based company with strengths in plant science research and development has demonstrated with a range of sprayed on formulations of plant ink technologies. Illumination is by UV lighting from patented LED lighting. However, what may be radical is DNA technology allowing for the flowering plant to come up with its own natural fluorescent generating protein!! Accordingly, BioSA, supported by the South Australian State government will have proprietary UV LED lighting combined with the innately bred fluorescent protein in flowers to show forth the magnificence of a fluorescent display of florals unparalleled before this. When one thinks of succulents, one thinks of Cacti. However, not all cacti are succulents and the storage of water in succulents give rise to their fleshy swollen appearance of 'succulence'. 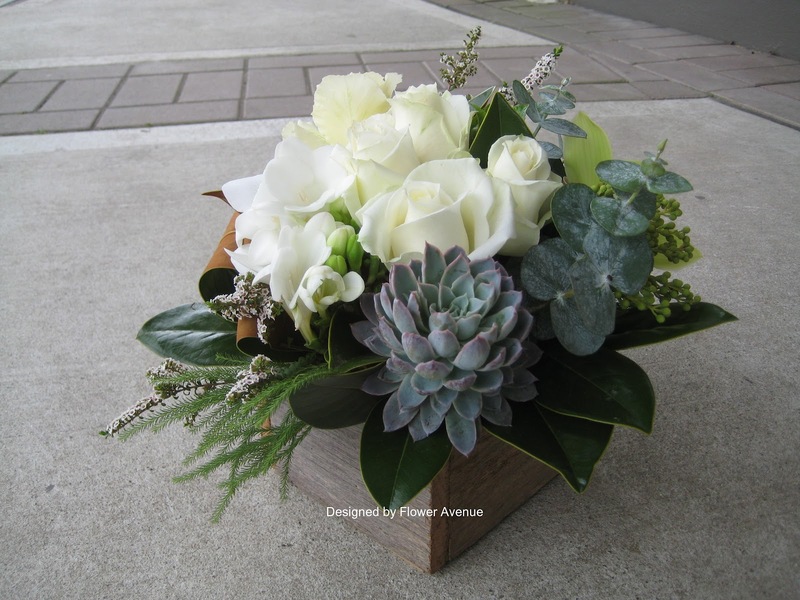 It is this very exotic look of succulents that accentuates the aesthetic feel and look of a floral arrangement. Complement this with elegant white and green themed flowers in a rustic boxed container gives a romantic and natural feel to the arrangement, perfect for for an intimate dinner party or elegant engagement dinner decoration. 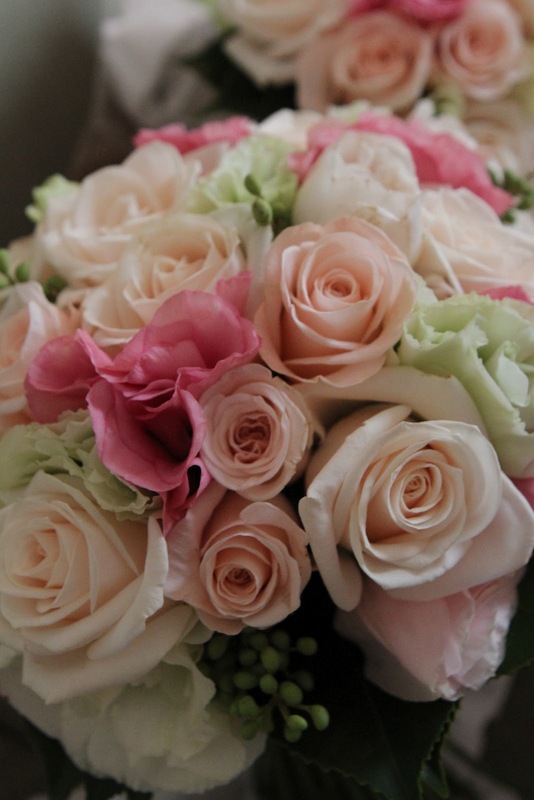 One of our beautiful bride with a peach, pink and soft green bouquet. 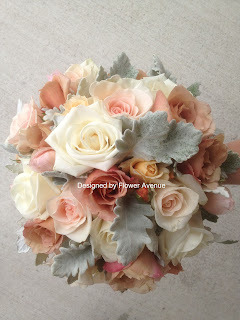 Creating the perfect match for a romantic and soft peach colour theme for the wedding. Capturing the colour theme throughout the reception at Mandalay Lane Cove with a bridal table centerpiece and petite vase arrangement with a candelabra and tea lights. Giving a very warm and romantic feel to the evening. Beautifully Captured by Deyan Photography. Rustic-ness evokes nature in all its splendor with vintage warmth in earthy tones. For those who simply adore natural elements in life, a rustic look for your wedding is the way to go. Inspiration for a beautiful rustic look bridal bouquet should come from nature. From its tan shades to an assortment of natural elements like berries, dusty Miller (pictured inset) and birch freshly plucked from say , a country garden. To complement its rustic qualities, hessian can be used to accentuate the earthy tones of a rustic wedding look for the reception. To achieve the rustic look that is both chic and beautiful, make an appointment with our wedding consultant to discuss how to make it possible. Put simply, flowers have the positive emotive powers to create happiness and increase enjoyment and life satisfaction. According to M.J. Ryan, award winning author of the Random Acts of Kindness books, "a successful person is not necessarily someone with a lot of money and material goods, but rather someone who is in tune with people and knows how to touch their hearts.......I can think of no other item besides flowers that evokes such positive feelings and perceptions for both the giver and the recipient". We are a multi-award winning flower store, consistently recognised by the Sydney Flower Market as an 'Outstanding Achiever in Flower Quality and Customer Service'. We focus on giving you Value-for-money, Quality and Service. We guarantee the freshest of flowers and hampers and deliver flowers in Sydney, Interstate and Overseas.